(Nanowerk News) Graphene is the miracle material of the future. Consisting of a single layer of carbon atoms arranged in a honeycomb lattice, the material is extremely stable, flexible, highly conductive and of particular interest for electronic applications. ETH Professor Tilman Esslinger and his group at the Institute for Quantum Electronics investigate artificial graphene; its honeycomb structure consists not of atoms, but rather of light. The researchers align multiple laser beams in such a way that they create standing waves with a hexagonal pattern. This optical lattice is then superimposed on potassium atoms in a vacuum chamber, which are cooled to near absolute zero temperature. Trapped in the hexagonal structure, the potassium atoms behave like the electrons in graphene. “We work with atoms in laser beams because it provides us with a system that can be controlled better and observed more easily than the material itself,” explains Gregor Jotzu, a doctoral student in Physics. Since the researchers focus primarily on understanding quantum mechanical interactions, they describe their system as a quantum simulator. Haldane had suggested that it might be possible to create an entirely new class of materials with exceptional properties determined by their topology. Mathematically, objects have the same topology if they can be transformed into each other by continuous deformations, such as compression or stretching. For instance, an orange could be deformed into a banana. If the transformation requires a cut, then two objects are topologically distinct; for example, a Möbius strip can not be transformed into a normal strip without first cutting and then reassembling it. 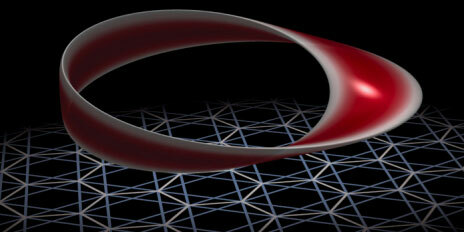 In the Haldane model, the system no longer has the same topology as ordinary materials. Implementing this system requires a special ‘ingredient’ and physicists speak about breaking a symmetry: time-reversal symmetry is broken. This means that the system does not behave in the same manner when time runs backwards. Normally, a physical system appears the same whether time moves forward or backwards; that is, this symmetry-breaking does not occur. Theoretically, this could be realised in real materials using magnetic fields. However, the magnets would have to be smaller and placed more precisely than the distance between atoms in a solid – less than about 0.1 nanometres. Using the quantum simulator, the researchers can break time-reversal symmetry with a relatively simple trick, as they have just reported in the journal Nature ("Experimental realization of the topological Haldane model with ultracold fermions"). “We shake the entire system in a circular motion,” says Jotzu. The researchers placed small piezoelectric crystals on mirrors which reflect the laser light and then allowed them to vibrate. “It’s even audible, roughly like a high flute tone,” says the physicist. At the right frequency and amplitude, the atoms do not fall out of the laser lattice, as one might expect, but instead remain trapped. When the researchers moved the system back and forth in a straight line, the atoms still behaved normally. But when shaken in a circular motion, “the particles experience a twisted world”, explains Esslinger, just as the movement on a Möbius strip would differ from that on a normal one. The topology and hence the properties of the system changed as though it had become a completely different and new material. It was a surprise that they could implement the topological Haldane model experimentally, says the ETH professor; the experiment was “like shooting from the hip”. The researchers celebrated their success fittingly with the right drink – shaken, not stirred. But Esslinger warns against drawing hasty conclusions: “We don’t create new materials. We just tested a concept.” In this context, experiments with lasers and ultracold atoms can be superior to computer simulations when a system is too complex for calculations. “This allows us to investigate the properties of materials that don’t even exist yet,” says Jotzu. It is still uncertain if the results obtained with the quantum simulator could one day be transferred to real materials. But there are already ideas: If circularly-polarised light could be sent on to real graphene, it may have a similar effect as shaking artificial graphene in a circular motion. This was proposed by two visiting Japanese colleagues, says Esslinger. So it may be possible, for example, to make an insulator out of a conductive material using light – and vice versa. The electronic applications of such a system, which could react extremely fast, would be manifold. The work at the Institute for Quantum Electronics was conducted within the Quantum Science and Technology (QSIT) research network. In addition to ETH Zurich, QSIT includes groups from the universities of Basel, Lausanne and Geneva, and IBM Research.